One of my absolute all-time favorite flowers is the Lily of the Valley. Resembling tiny bells or baby bonnets dangling from a slender stalk, the lilies arrive every spring to disperse their heavenly fragrance. 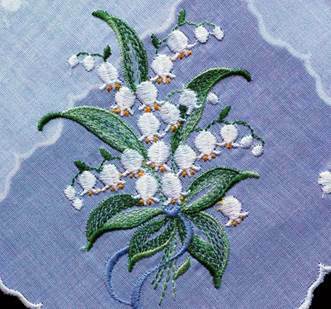 According to the book The Language of Flowers, Lily of the Valley symbolizes a Return to Happiness. The author opines “It is the sweetest flower imaginable. 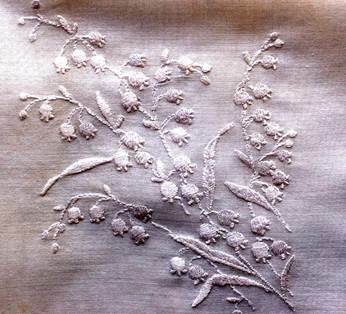 With its dainty white bells and unmistakable green scent, it is said to lure the Nightingale from his nest and lead him to his mate.” Personally, I found it romantic that Kate Middleton chose Lily of the Valley interspersed with Sweet William to adorn her bridal bouquet. Particularly popular in France, these woodland flowers have been considered to bring good luck since the time of the Renaissance. Kate’s Myrtle came from the original plant started from a sprig of Myrtle from a nosegay given to Queen Victoria by her mother in law. 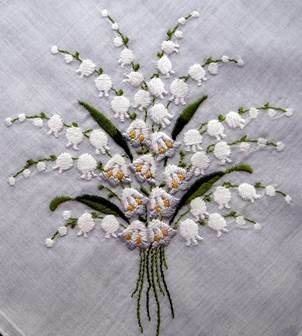 A favorite with brides, Princess Grace’s bouquet consisted solely of Lilies of the Valley. (see The Wedding Bouquet). 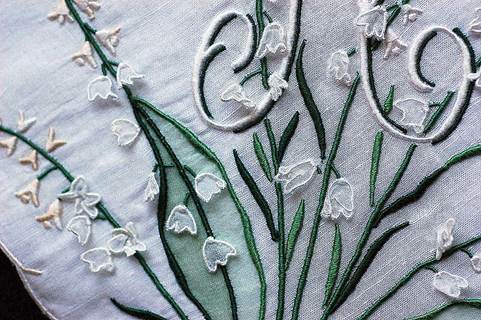 Frequently embroidered on bridal handkerchiefs, the lily can be found in traditional white, as well as a plethora of permutations. There’s something for every taste. I enjoy collecting multiples of a single image, as I find it interesting to see how different artists interpret the same material. 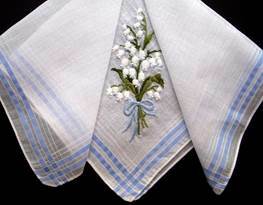 Border hankies are the perfect accompaniment for a bride to carry with her bouquet to catch her tears of joy. 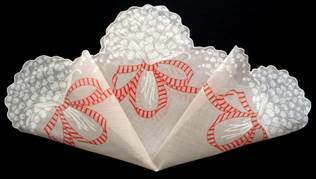 Infinitely more attractive than the ubiquitous wad of Kleenex, bridal handkerchiefs are as intricately embroidered as any gown, and are meant to be seen and admired. 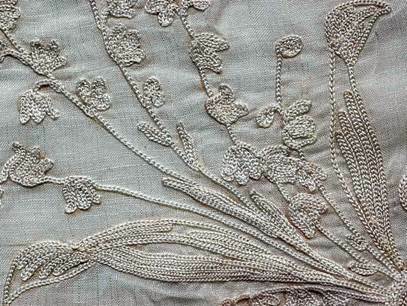 Note the delicate stems of lilies adorning the scalloped border. Stunning and spectacular for a bride of any age. 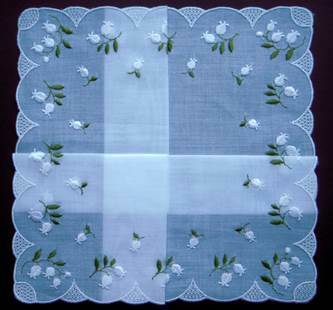 Delicate eyelet combined with a scalloped border and blue and white lilies create a youthful, charming hankie. 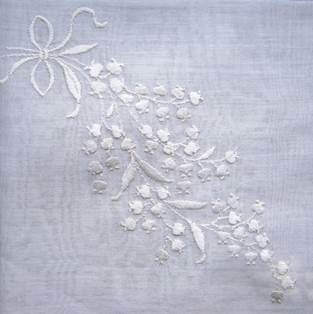 Blue scalloped organdy embroidered with snow white lilies conveys a feeling of elegance and sophistication . Onboard a boat in Nantucket, the celebration carried a nautical theme. On the beach in California, this ceremony also had a nautical theme. 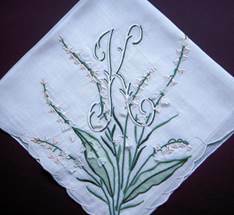 Intricate details in this initial “K” hankie. 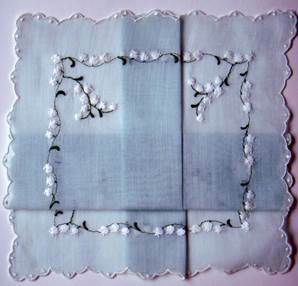 The floating petals and translucent leaves are delicate organdy. 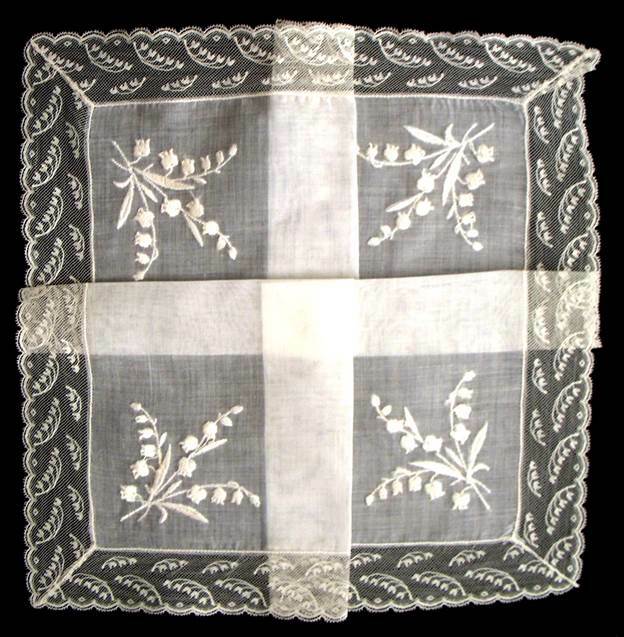 Any one of Jane Austen’s heroines would have happily carried this lovely nosegay to the country church on her wedding day. 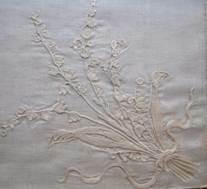 The simple chain stitch is the sole brush stroke used by the artist on this antique linen canvas – to perfection. 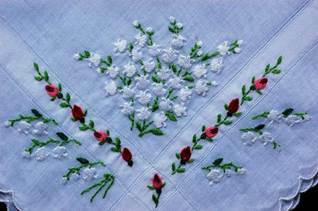 Victorian chain stitch depicts a country bouquet wrapped in cascading ribbon. 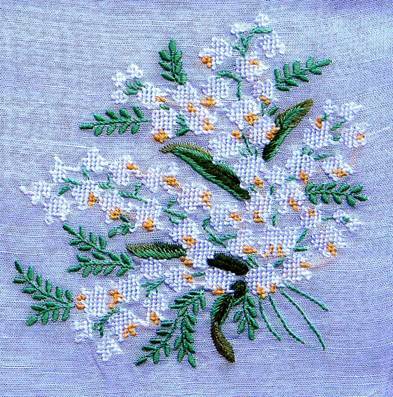 Needlepoint lilies on a crisp linen background, with whispers of fern. A true labor of love. 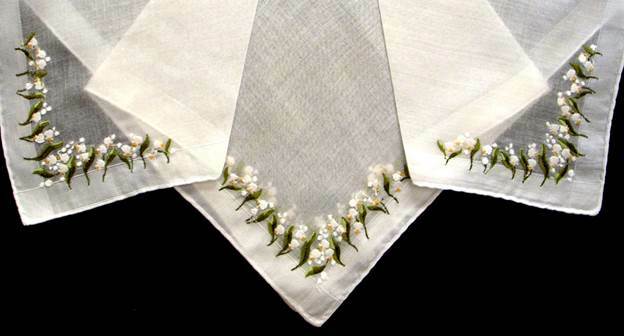 With the lily of the valley symbolizing humility, return to happiness and trustworthiness, and violets symbolizing modesty and faithfulness, what better combination could a bride wish for her handkerchief? 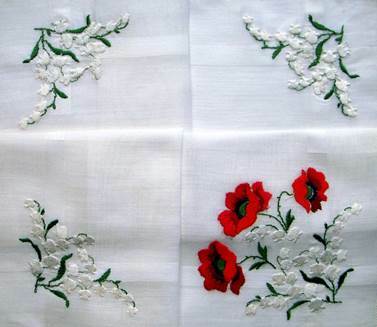 The red poppy symbolizes pleasure and extravagance. 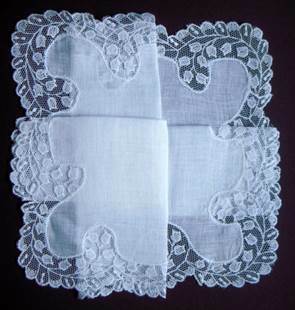 Perhaps this hankie tells the story of a transition from innocence to pleasure? Or a happy blending of the two? 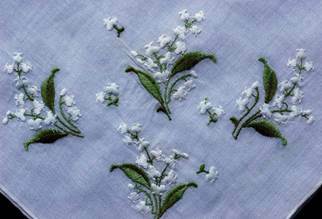 The contrast of a brilliant floral with the delicate little bells is quite appealing. Since the poppy is the state flower of California, what a perfect gift for a west coast girl. 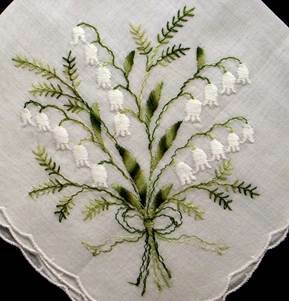 I’ll close with this almost ghost like appliqué image complete with girlish bow. I will always and forever have a soft spot for appliqué. It whispers, never shouts, and just seems gentle to me. 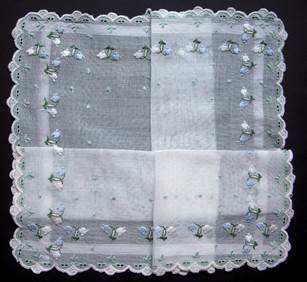 This sweet hankie would be perfect for the shy bride. John Fairchild, of Fairchild Publications – W and WWD, in his book The Fashionable Savages recounts a time in July 1964 when he was backstage at a Dior couture show, and notice Marc Bohan checking the model chart which was “pinned to the wall with a sprig of Lily of the Valley – the good luck flower of the House of Dior.” Monsieur Dior had always sent one model out onto the runway with a sprig of Lily of the Valley in her buttonhole. My father passed in 2007 I took care of him his last year of battle with cancer. This week for some reason I have been very “blue” thinking of my Dad more than usual. Wondering if he is at peace. My heart tells me he is, but sometimes my mind will doubt. Lily of the Valley was always his favorite flower. In fact they are engraved on his headstone. I remember as a little girl sneaking out on a cool spring night and picking one to put in the visor of his car, so that when he got in the car to go to work his car would smell sweet. We were both sad each year when the blossoms faded with the summer heat. 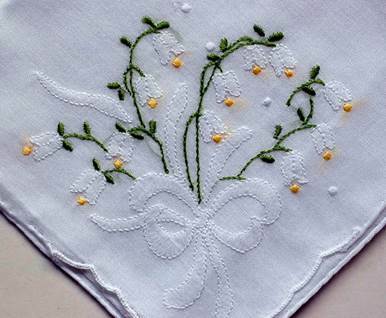 When I came to this site the first hankie that caught my eye was the embroidered lily of the valley. What I didn’t realize until reading your blog is the meaning of the flower. “Return to Happiness”….You have no idea the peace and the tears that washed over me after reading that. Before writing this I said a Prayer of Thanks, as I know that it was the answer I was seeking to put my mind at ease. PS I also thanked Him for connecting me with you. This is such a beautiful story; thank you for sharing it. I truly believe your father was instrumental in connecting us in order to convey the message all is well, and chose an image you would easily recognize. How delightful. You have a guardian angel watching over you, who holds his hand over your heart, and rests his other in the hand of God. (I also cared for an ill parent and the sadness comes in waves, so I do understand.) It would be grand if you had a talisman to carry to remind you of his unconditional love – perhaps one of his handkerchiefs? 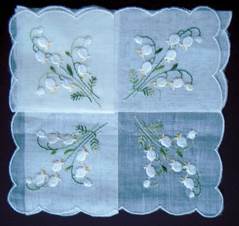 If that’s not possible, perhaps carrying a lily of the valley handkerchief in your pocket can bring a smile to your lips as well as your heart on those days when the sunshine just can’t seem to break through the clouds. Blessings to you. I just stumbled upon your website and am astonished by the beauty of it. 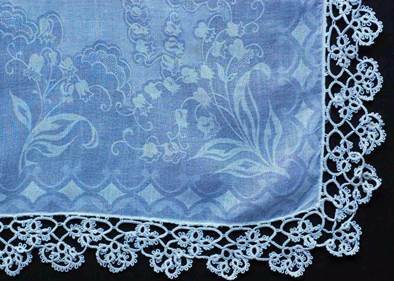 Your collection of hankies, the photograph quality, and your beautifully-crafted text is breathtaking. It this evolving into a book? Some 30 years ago as a field rep in California, I traveled to meet clients in their homes from town to town. 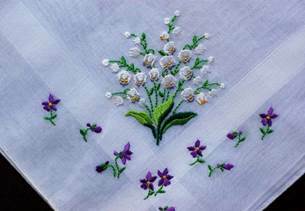 When my work was done,I would find antiques and 2nd-hand shops…and hunt hankies! The joy of the experience was delightful and I met many nice folks along the way. Then I was promoted to a position in the company building and, sadly, desk bound. Although not avidly, I have collected these little beauties ever since. And have hundreds. So, I understand your love for them and believe that the quality of your site reflects that. 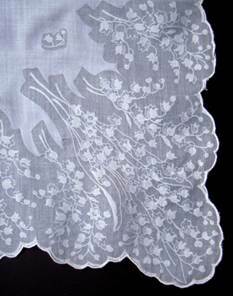 It reminds me of the exquisite attention to detail and meticulous work a cloistered nun may have perfected as she, herself, created a lace handkerchief ages ago. Thank you for your kind words. I do all of this “after hours”, so indeed it is a labor of love, and I’m never really sure just who I’m reaching. I would love to see your collection. 🙂 Perhaps one day…. I certainly would welcome the opportunity to capture these in a book to preserve and share with others.